ShareVault is a reliable and secure virtual data room where businesses can store and share due diligence documents in the cloud. The cloud-based data rooms are shielded with tight and advanced security protocols but still provide users with a very user-friendly interface that allows quick and easy collaboration across their organization. Unlike most out-of-the-box, cloud-based document sharing solutions, ShareVault is designed for commercial use and therefore implements security controls that are enterprise-grade. Traditional virtual data rooms are more secure than cloud-based document sharing and management platforms, but are clunky, hard to deploy, and not so easy to use. ShareVault, on the other hand, offers simplicity and nimbleness without sacrificing security. Document storing and sharing is an essential aspect in the modern business landscape. ShareVault provides businesses with secure virtual data rooms where they can store and share due diligence documents that contain sensitive information without worrying about security. ShareVault data rooms solutions come with a plethora of security options that give users total control over the way the store and share their documents. 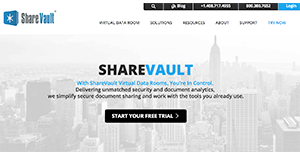 Tight and advanced security protocols coupled with configurable permissions and authorizations make ShareVault a top choice for big corporations and businesses around the world when it comes to secure, enterprise-level cloud-based virtual data rooms. ShareVault is a full suite of high-end features and functionality and is designed to be very fast, responsive, and easy to use. Users can easily set up, modify, and manage their own data room, typically in less than an hour. Users also get a a dedicated project manager on top of a responsive 24/7 support with knowledgeable individuals standing at the ready to help when issues arise. ShareVault is loaded with features that makes document storage and sharing simple, quick, and effective. Users have total control on who can have access to documents, set permissions, and even share sensitive files on computers and devices outside their IT network. Users can also disable copy and paste functionality on documents that contain critical data. What Problems Will ShareVault Solve? A small to mid-sized organization is seeking funding and must assign multiple different permissions to documents that will be shared with many 3rd parties. ShareVault’s tag permissioning feature makes it easy to permission folders or documents across many folders. The audit trail allows for a user to see who has accessed the documents for insight that helps with preparation and to gain knowledge about who to include in the meeting. If a user focuses on a particular aspect of the organization, you may need to include a specialist. The Q&A function enables for controlled collaboration between the admin and 3rd party end user to get questions answered as they are asked. A biopharma would like to share their new drug application with third party consultants, CROs or CMOs for input prior to submission to the FDA. The ShareVault eCTD viewer allows members of the biopharma regulatory team to share the document within the secure ShareVault solution. All document control and management features – IRM, granular permissioning, audit trail – is available within the eCTD viewer. Also – all hyperlinks between documents remain intact. A mid sized biotech is seeking a partner to advance their drug through the development cycle. They need to share different research with different organizations as they seek a partnership. ShareVault brings efficiency by allowing the admin to batch upload documents and then apply granular permissioning based on user and company to share subsegments with different organizations. The biotech can then gauge interest level with access to who has accessed what and for how long. This allows the business development manager or CEO to spend the right time with the right companies to form a successful partnership. If you are considering ShareVault it may also be beneficial to check out other subcategories of Best File Sharing Software collected in our database of SaaS software reviews. Each business is different, and might call for a special File Sharing Software solution that will be designed for their business size, type of customers and employees and even particular niche they deal with. You should not count on finding a perfect app that will be suitable for each business regardless of their background is. It may be a good idea to read a few ShareVault reviews first and even then you should pay attention to what the solution is intended to do for your company and your employees. Do you need a simple and intuitive app with only essential functions? Will you really use the complex functionalities required by pros and big enterprises? Are there any specific tools that are especially useful for the industry you work in? If you ask yourself these questions it will be much easier to find a reliable app that will fit your budget. How Much Does ShareVault Cost? We realize that when you make a decision to buy File Sharing Software it’s important not only to see how experts evaluate it in their reviews, but also to find out if the real people and companies that buy it are actually satisfied with the product. That’s why we’ve created our behavior-based Customer Satisfaction Algorithm™ that gathers customer reviews, comments and ShareVault reviews across a wide range of social media sites. The data is then presented in an easy to digest form showing how many people had positive and negative experience with ShareVault. With that information at hand you should be equipped to make an informed buying decision that you won’t regret. What are ShareVault pricing details? What integrations are available for ShareVault? If you need more information about ShareVault or you simply have a question let us know what you need and we’ll forward your request directly to the vendor.